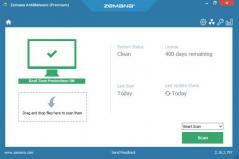 Zemana AntiMalware Premium is a robust security tool that can scan, detect and remove malware and many other security threats such as viruses, worms and Trojans. Once the system scan is complete, the application will attempt to remove any detected virus infections. Also, any of the files it detected as potentially dangerous can be uploaded to the Scan Cloud repository where it will go through a second scan and analysis. Zemana AntiMalware can also scan the PC for tracking cookies, and lets you schedule scans using the dedicated function. To create a scan schedule you need to select the scan method, day and time. Furthermore, you can set the scan to stop when hard disk activity is high or full screen programs are running.